PCA3 Casters: Not Included, Size: 24" W x 24" D Features: -10'' End grain work surface.-Wooden knife block.-Using only formaldehyde-free and low-emission formaldehyde gluing processes in manufacturing their butcher blocks.-Selecting individual trees for harvest, encouraging forests to renew and regenerate themselves naturally and prolifically.-Maintaining active recycling programs, with 95pct of all raw materials, scrap, and sawdust being recycled as fuel to heat their kilns. Construction: -Solid hard maple construction. 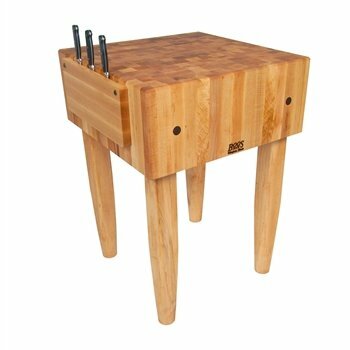 Dimensions: -All Pro Chef Butcher Blocks stand 34'' H.-18'' W x 18'' D.-24'' W x 18'' D.-24'' W x 24'' D.-30'' W x 24'' D.-30'' W x 30'' D. Collection: -Pro Chef collection. Warranty: -One year warranty against defects in workmanship and material.